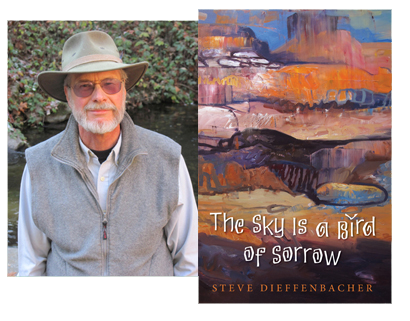 Steve Dieffenbacher's first full book of poems received a 2012 Bronze in Poetry from Foreword Reviews Book of the Year Award and his poem "Night Singer: Chaco Canyon, New Mexico" was a 2013 Finalist for the Spur Award for Best Western Poem from Western Writers of America. The Sky Is a Bird of Sorrow is an apt title for Steve Dieffenbacher's new book of poems. Like the sky, the scope of the poetry is wide, primarily a sweeping vision of spaces and eras specific to the West -- Oregon, New Mexico, deserts, mountains, ocean shores, the land and its people. The tone of voice, maintained almost consistently throughout the book, is filled with the sort of longing that beauty and wonder always occasion. Loss and searching, treated honestly and straighforwardly through human events and earthly, are Dieffenbacher's major themes. "On the rim of the canyon/I have come to find you." These gentle, well-considered poems travel American landscapes of the domestic, historic and prehistoric. In virtually every line, Steve Dieffenbacher celebrates the complications of human occupation and succession, always asserting the possibilities of a life well-lived: "if it be not now, yet it will come, our last and deepest love." From this poet whose German surname evokes a "deep stream" comes a collection both lit and shadowed from within by a Rilkean lyricism. Dieffenbacher gives us poems that can hear a "...continent's breath/heaving out of distance/from plains of frost." His is a gift capable of conveying the language of a wounded tree, its "...aching/broken top" its "...bell/of wooden bones." Brimming with stunning tropes, alive with liquid music, his poems carry "...the mute undertow of another earth." On these pages, a fortunate reader finds language that reaches "to the root of the world." When the geese call in late autumn, this book says, they call for you. Crossing borders, climbing the rim, holding a vigil at dawn, these poems forge elegy in each hour of each day, like birds graced with dark wings. In poems like these, even sorrow can fly. Steve Dieffenbacher has lived in Oregon's Rogue Valley since 1989. His poem "Emptiness" won the 2010 Poetry Prize sponsored by Cloudbank magazine of Corvallis, Oregon, and he has published in numerous regional journals. His poems also are included in Deer Drink the Moon (2007), an anthology of Oregon poetry published by Ooligan Press at Portland State University; in the chapbooks Universe of the Unsaid (2009), Voices of the Siskiyous (2006), and At the Boundary (2001); in the anthology Intricate Homeland: Collected Writings from the Klamath Siskiyou(2000); and in A Path Through Stone, a 1995 cycle of poems that includes the work by Bruce Barton, Jonah Bornstein and John Reid. He is an editor at the Mail Tribunein Medford, where he writes a monthly column focusing on nature and hiking for the newspaper's Sunday travel section. He has won various awards for writing, photography, and page design in his more than 35 years as a journalist.